J D Oswald is the evil doppelgänger of crime writer James Oswald, author of the Inspector Tony McClean novels of which I've read the first and don't rule out continuing with. Dreamwalker is the first of his epic fantasy series, The Ballad of Sir Benfro; as with his others, Oswald self-published the series and was picked up by a trade publisher following much solo success. I'm not a big fantasy reader but I've always suspected that's because I haven't been matched with the right author - I don't care for the po-faced pseudo-mythology of Tolkien, and Game of Thrones' endless chair-wrangling didn't capture me enough to have taken the second one for a whirl yet. 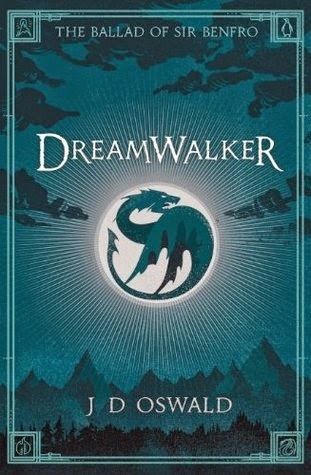 Dreamwalker, though, is great. It opens on a dark and stormy night (yes, I know, it doesn't sound great on paper) with a priest, Father Gideon, hustling an unconscious (and fairly pregnant) princess to a trustworthy healing woman. Who is a dragon. With an egg. A few pages later and we're one fulfilled prophecy closer to a tale of an Heir Who Doesn't Know It. It's okay though, because while we have that, we mainly have the story of Benfro, occupier of the aforementioned egg. Initially it's a bit confusing - Benfro is a dragon, he lives with his mother close to a dragon village. He learns to hunt, has a bow, and lives in a house. My logistics circuits struggled. It's only when Benfro meets his first human - in what was one of the best bits of the book for me - that we get any idea of how things work. It's not much of an idea, but once I'd got used to Benfro the character I didn't actually care about being pedantic. Next week, tune in for a wolf eating the sun. I *loved* Benfro. I don't know why, but I found him tremendously endearing. He's 13 years old (which is *nothing* in dragon years), has magical talents he doesn't understand, and is constantly frustrated that his desire to learn is tempered by his mother's (and the other dragon's) caution. Unlike most books with child-age heroes - for instance, Harry Potter - there's no pantomime emotion from the supporting cast. In Gwlad, men have hunted dragons to the point of extinction. Inquisitor Melyn is the head of the High Frydd, an order of warrior priests whose task it once was to complete this mission. Once Beulah reaches the age of majority, she'll stop keeping her father alive and under her authority, the task can be completed. Melyn and Beulah's story is a mix of intrigue and power games, of magic and gods and a hefty dislike of dragons. I *liked* it. Something else I like is the Welsh flavour. As Tolkien drew on Norse mythology for his world building, Oswald uses Wales - from using place names for his dragon characters (Sir Benfro is the proper name for Pembroke, Ynys Mon is Anglesey, etc) to appropriating legends like those of Gog and Magog. There are lots of things to spot, and it's slyly clever, nudging you in the ribs to see if you get it. However, Dreamwalker suffers one great weakness: it's not really a book. It's the first 400-odd pages of a book. There's no particular story for any of the characters - they're all just doing their thing to a greater or lesser degree of interesting until the narrative reaches an excellent point for a cliffhanger. Although Books Two and Three in the series are already available (and, like the first, are in the Amazon UK Kindle Summer Sale until September 1st) and I have seen mention of Book Four as being written, it would be tremendously damaging to Dreamwalker if they weren't. Don't let it put you off, but go into it prepared to get the next one immediately. For me, Dreamwalker worked. Great characters, great world-building, great details in that world building, and some lovely touches of humour. I'm already 20% into the second and will very likely be buying the third before the Kindle sale is over. I'm quite tempted to knock half a star off for that cliffhanger, but I'm also Welsh so am hopelessly biased: 4 stars.